The morning meeting featured Armistice or truce at the end of WW1. 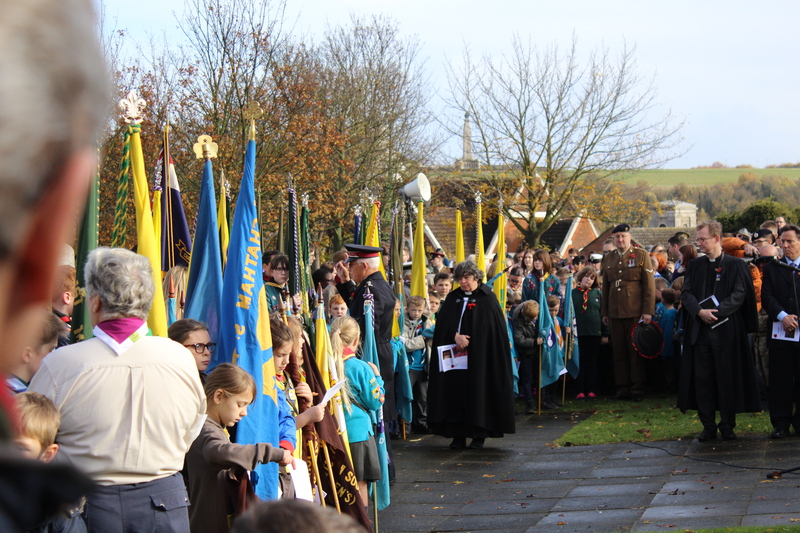 Major Ian Payne spoke about the need for Peace after a ‘war to end all wars’. He reminded us that Jesus stretched out His hands to reach a fallen race. 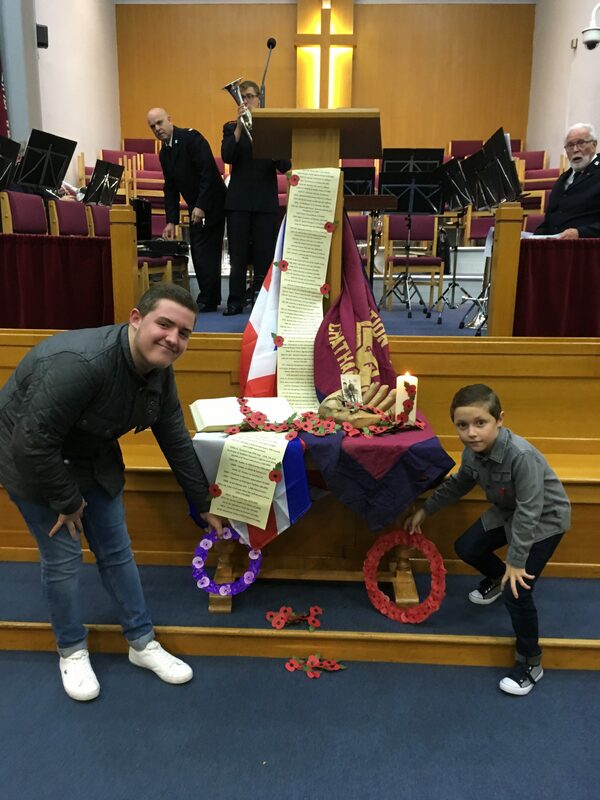 The Holiness table was wrapped in two flags – the Union Flag and The Salvation Army banner. A scroll several feet long displayed a list of all the many wars since 1914-18 WW1. A two minute silence was observed when a bugle played the Last Post via a moving video presentation. The evening meeting was led by the Chatham Band. In the evening two boys went forward and placed wreaths at the foot of the Holiness Table. Pieces played were ‘Prince of Peace,’ ‘Torchbearers’ by General Osborn, ‘The Prayer’ (duet by Adrian Horwood and Chris Boughton). and the Band played ‘Make Me A Channel of Thy Peace’. Rosemary Steadman Allen spoke about Peace quoting ‘Lord Make Me A Channel Of Thy Peace’ . 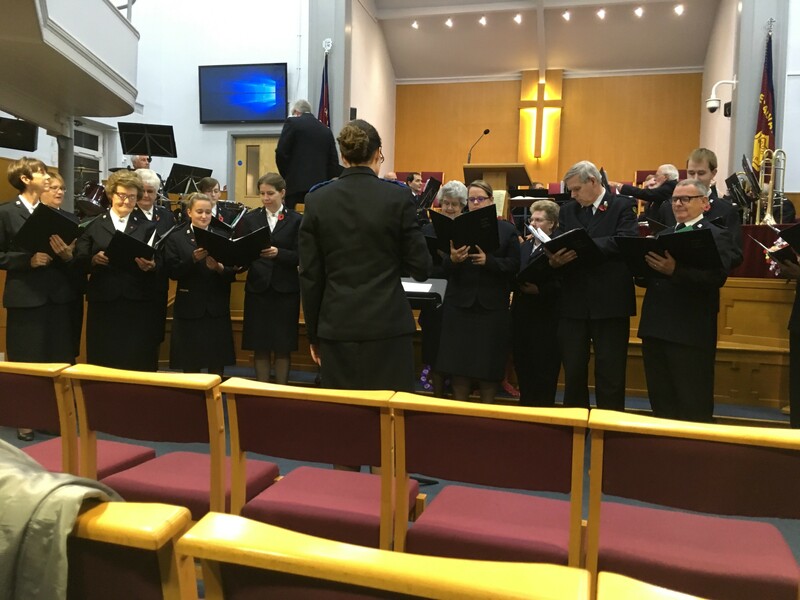 The Band then played ‘Songs of Salvation’, Ryan Cripps played a horn solo -‘This Time for Peace’ followed by ‘Solemn Melody’ by the band. 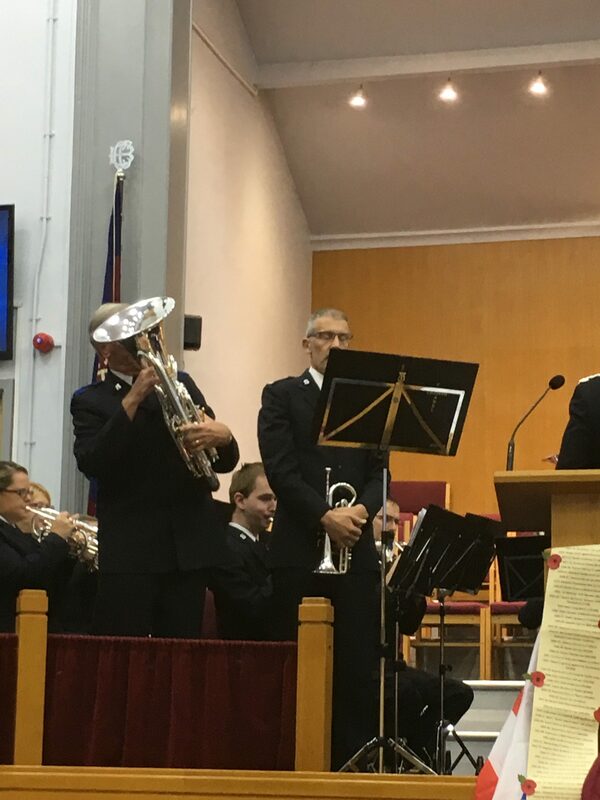 To conclude the band played the bugle call ‘Sunset’ before accompanying the congregation singing ‘I vow to thee my country’. A surprise finale included several favourites of the War Years! This entry was posted in Church Life, Community, Front Page, Monday Spot, Service, Worship. Bookmark the permalink.